The Grand March for Life and Peace concluded last night with a rousing rally in Jeju City along the sea wall (that reminds one of the Malecón in Havana). As our east team met the west team in the center of the city each side carried one of two large banners depicting wooden totems that now stand in front of the peace center in Gangjeong village. The two banners were brought into the busy traffic clogged intersection and symbolically joined. From there the two merged teams walked the last few miles to the rally site. The totem banners were erected onto the large stage and as dark came, and the stage lights hit the banners, the beautiful colors came alive in a brilliant display. I was very moved to stand on that stage and deliver the message representing the international guests. As you can see in the short video above, taken of the west team during a storm, not even a down pour bothered the walkers. Very few pulled out umbrellas or raincoats - most just keep moving along to the music coming from the sound trucks. In the meantime I must say thank you to all our new friends and co-walkers for this incredible experience. Despite the fun and the excitement of the walk what must come first is the reminder that the people in South Korea are witnessing their democracy being dismantled each day by the right-wing Park government. They are seeing their country, already long a US military colony, become even more so as Washington rushes to prepare for war with China and Russia. In my short talk last night I told the hundreds who were assembled at the final rally the story of our protest in Bath, Maine last June when 12 of us (Zumwalt 12) were arrested at the Bath Iron Works shipyard for blocking the road and gate into the 'christening' ceremony for a new warship. I said that warship was likely to visit Gangjeong village at some point. 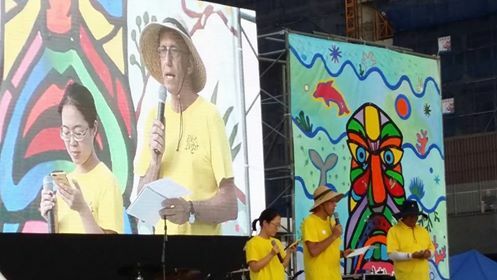 I told the people that they inspired us in Maine to act - in fact five of the 12 of us who were arrested have been to Gangjeong village over the past few years. I said we'd continue to support them into the future. We all have much to learn from the biggest little village on the planet called Gangjeong. Day 3 from the 5th annual Grand March for Life and Peace here on Jeju Island, South Korea. Yesterday we walked about 13 miles in the hot heat (and sometimes rain). We hit the area called Seongsan by the end of the day that is presently mired in its own fight against the government. 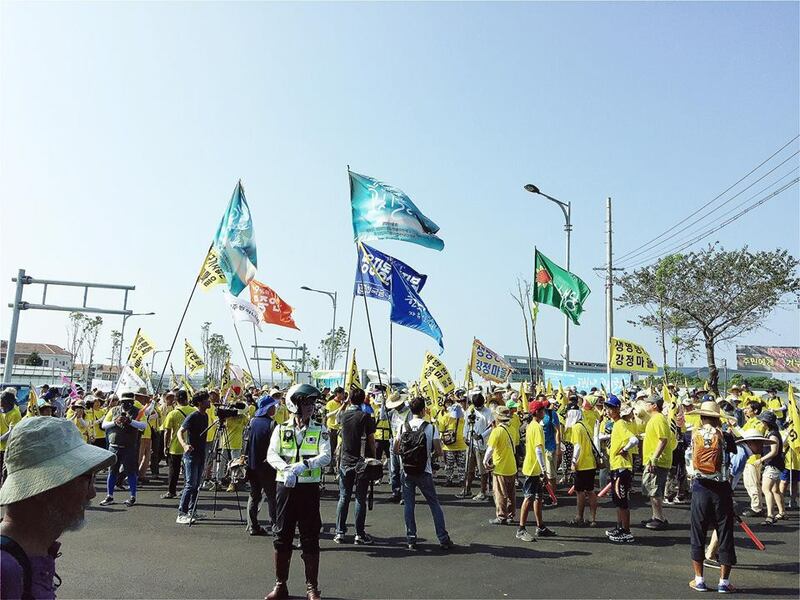 Without consulting the residents of Seongsan, or any other villages in the area, the South Korean government (which is totally controlled by the mega-corporations) has announced their intention to build a second airport on Jeju Island. The current airport is in Jeju City which is on the northern part of the island while Seongsan is on the southern side of the egg-shaped island. Last night during the after dinner nightly walk program we heard from the local committee leaders opposing the airport plan. It appears that more than 75% of the villagers in Seongsan would lose their homes and four other nearby villages would also be severely impacted. The chairman of the opposition committee told us that they believe the airport is related to the Navy base in Gangjeong village. It seems that the Pentagon does not want to port their expensive destroyers, nuclear subs, and aircraft carriers in Gangjeong village without 'close air support' thus the need for an airfield nearby. But the government knows that another US military base would create big political problems so they are saying the airport would only be for civilian use. By now the people here understand that the US and South Korean governments lie about virtually everything. One of the most impressive things about the peace walk is the numbers of children and young people who are walking. There are a group of 5-6 kids who have undertaken the job of handing out walk flyers and they spend the entire day running from house to shop as well as plastering the flyers at bus stops and on light posts. As we pass by people watching us walk, I notice that most find it very difficult not to take a flyer from these kids. I think of them as the 'wild pack' and smile. I don't know where they get the energy to keep it up all day long but I need some of it! Today Ken Jones and I are taking a break from the walk. I had some Global Network tasks needing immediate attention and later in the day I will take Ken to the April 3 (1948) massacre museum near Jeju City. You can't come here without learning more about the US-directed massacre of more than 30,000 Jeju Islanders after Washington took over Korea from Japan at the end of WW II. The US installed into power the Koreans who had collaborated with the imperial Japanese during their occupation of this country. The public, thinking that the defeat of Japan meant their freedom, were angered and began to protest against the US installation of these right-wing Koreans. The US responded by enforcing the systematic killing of well over 100,000 Koreans across the nation who opposed the way the US was running the country. In the end this dynamic is what led to the Korean war that still is unsettled as Washington refuses to sign a peace treaty with North Korea. Ken and I get back on the walk tomorrow morning and over 2,000 people are expected in Jeju City for the big finish program on Saturday evening. After being deported back to the US, Rhee and Lee spoke with ZoominKorea about their deportation and their thoughts on the South Korean government’s attempt to isolate the residents of Seongju (where the THAAD missile defense system is to be deployed) from international solidarity. 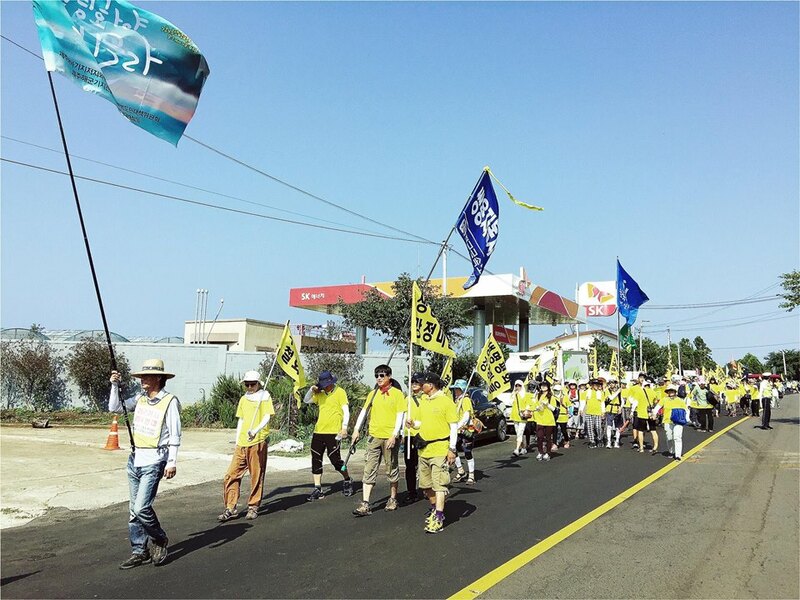 Day two of the Jeju Island peace walk in South Korea was another hot one. We did 13 miles and everyone was very tired by the end. One man who specializes in fixing blisters was quite busy from morning until 8:00 pm helping the walking wounded. I developed just a tiny blister on the back of my heel from the rubbing of my sandals. Going to have to wear socks and shoes today which I have dreaded doing because of the heat. In the photo above you can see the dish washing operation back at Gangjeong village. They make three meals a day and bring the food out to the walk in trucks. Then the dirty dishes are brought back to the village and washed. Remember that there are two walking groups - going east and west - so this is a major logistical undertaking. Last night as we lined up for the supper meal - served outside - I was transfixed as the long line of people began singing together, accompanied by guitar and flute. The walkers come from across the country and are activists from various movements including labor, church, human rights, Korean Green Party, alternative schools, peace and more. Quite a few Catholic priests and nuns (dressed in their grey habits) are also walking. It's amazing to experience 150 or more people constantly singing as we walk along (yesterday we began at 8:00 am and finished at 5:30 pm. We took 90 minutes for lunch and took a 20 minute break every hour). The singing helps keep the tired and hot feet moving along nicely. Last year the US spent 34% of the world total in military spending - Russia spent 4.8%......who is the real threat to global peace? The US has 1,000 foreign military bases - Russia at most has 4-5 bases outside their borders. Who is provoking global instability? VFP members Ken Jones (left), Bruce Gagnon (center) and Will Griffin (right) remembering the two Korean-American women who were to lead our trip to Korea but were denied entry into the country due to their work against US deployments of the THAAD 'missile defense' system here that will be aimed at China and Russia. We gathered at the new Navy base front gate this morning just after 8:00 am in order to get registered for the six-day peace walk around Jeju Island, South Korea. Many in the crowd walked down an entry road to the main gate that of course was blocked off with higher than normal security standing guard while military music blasted out for all to hear. It was sad to see the new base housing for military personnel and their families and to get a glimpse of the warship docks. I was imagining very soon that US Navy destroyers, nuclear submarines, and aircraft carriers will be ported there. Gangjeong village has a population of 2,000 people and there are expected to be anywhere from 3,000-7,000 navy personnel based here at some point. And then figure in the many hundreds of sailors on visiting warships. This once quiet fishing and farming community will be torn asunder even more than it already has been. Gangjeong villagers though have proven to be determined and resilient during this 10-year non-violent struggle to oppose the Navy base. Before we began walking this morning a news conference was held right in front of the main gate and the village Mayor Cho Kyung Cheol said that "People in the village have been treated like dogs and pigs" by the Navy and the government. He spoke of even more lawsuits being filed by the government and Samsung (the lead base construction contractor) seeking $3 million in 'damages' against the village and 116 persons in the village (and their supporters) because they allegedly impeded the construction process. One activist called the fines "A new form of oppression" against the village. Former Mayor Kang reminded the walkers of the "dignity of nature" and said, "We will continue to work to stop the Navy base. We remember the people all over the country, and around the world, who have helped us. The Navy base will help lead to war." Six hundred people registered for the peace walk with two teams evenly divided - one heading East and the other West. The international guests (from Taiwan, New Zealand, US, Japan, Philippines and Ireland) were split between the two teams. Our Veterans For Peace delegation is with the east team. We walked 11.5 miles today in the high heat and the hot top (what Boston folks call the asphalt) only made it worse - sort of like walking for six hours through a steam room. 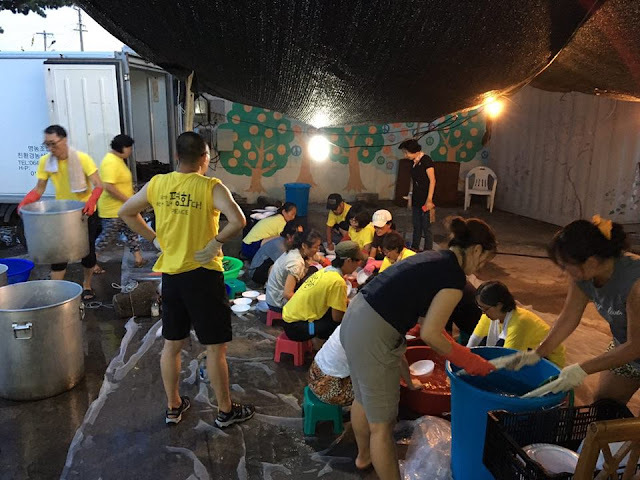 Everyone was sweating but it was remarkable to see our large group stay together the whole way - especially so because many families came from the Korean mainland and brought their small children and they walked the entire way. The food was prepared by teams of volunteers back in Gangjeong village and trucked out to us for lunch and dinner. During breaks and lunch the iconic Catholic priest Fr. Mun joined us hobbling around with his cane but still inspiring people as he as done in virtually every progressive movement in South Korea for many, many years. Jeju is a tourist haven during the summer so the traffic was heavy while we walked today. We walked along the beautiful ocean, through small villages, and through a densely populated city - even spending at least an hour taking up one lane in a very busy four-lane highway. So we are being seen - it's really quite a sight to see a couple hundred people singing and dancing with their yellow shirts and flags flapping in the breeze. I am glad to be here - sun burnt, sore feet, but soaring heart. There is only one way that we might be able to stop the crazy US imperial war machine and that is by organizing global protests and taking the war and peace issue directly to the people. It's an honor to be part of this peace walk.